In Örebro, a city of some 110,000 people and a two-hour drive west of the capital, Stockholm, there is a surprisingly high demand for a crane fitted with a personnel basket; in fact, more than the city's technical department had expected when they decided to acquire one last August. 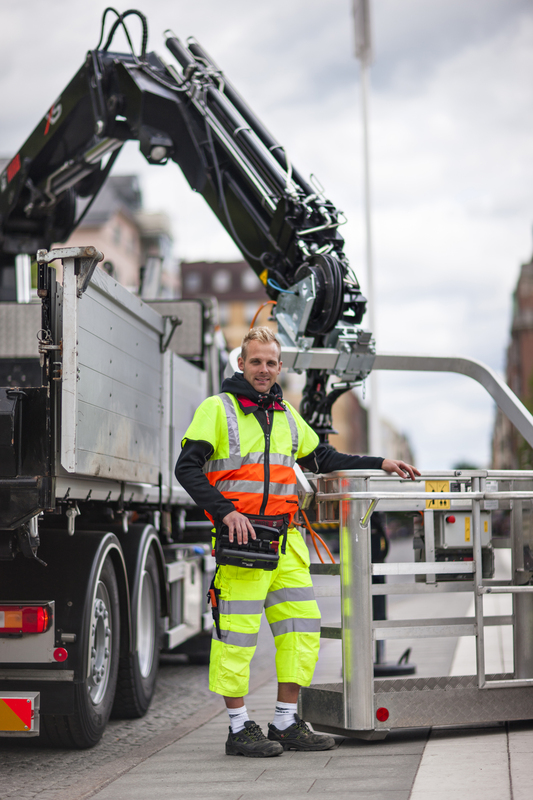 Sebastian Söderlund has quickly become one of the most popular crane operators in Örebro. Not only is he good at what he does, but he is also behind the wheel of a truck equipped with a Hiab HiPro crane and the MEWP, Hiab's Mobile Elevating Work Platform. "We have different kinds of assignments all the time, from setting up signs to helping out at a construction site to jobs in city parks. The MEWP gives us a lot more flexibility that renting a skylift would," Söderlund says. The Hiab XS 144 reaches 14 meters and the XS 166 up to 20 meters at a boom angle of 70 degrees. This means that at one point heavy loads can be delivered far out, and the next maintenance work can be done 20 meters up in the air. The cranes comply fully with the EN 12999 standard used for loader cranes. The safety requirements for the basket are set by EN 280. "A typical customer is an entrepreneur who is looking for a way to add more flexibility to his operations. These are often smaller companies but even a bigger fleet would benefit from having a truck equipped with the MEWP," says Bengt Söderholm, Product Manager at Cargotec Sweden. "With Hiab MEWP crane, we wanted to offer a multifunctional service. Our clients' needs are expanding to new territories. To best support those we now offer cranes that can even be used to install glass windows, streetlights, power lines, etc", continues Söderholm. 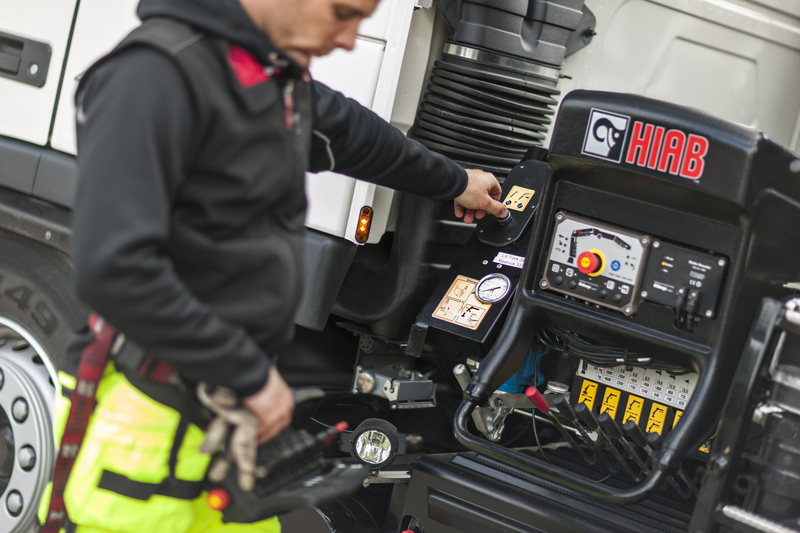 A Hiab HiPro crane is still a crane, first and foremost, and it is optimised for that. But when it is transformed into a mobile elevating work platform, certain changes occur. "When used in the MEWP mode, the normal crane speed is reduced and the crane moves at a vertical speed of 0.4 meters per second, the maximum speed allowed by EN 280," says Söderholm. The MEWP has been designed with safety in mind. It includes an automatic horizontal levelling of the basket, external safety rails to protect it from crushing, a battery charger and a back-up battery mounted in the basket, vertical and rotational speed controls, and a separate push button emergency stop in the personnel basket. It also has a system that ensures that when the basket is in use, its stabilisers and their extensions are fully extended and in the right position. It has swivelling support plates on the stabilisers for maximum ground contact, and an emergency lowering facility and a manual emergency pump in case, for instance, of a loss in power. "Should the vehicle run out of power or something else unexpected happens, I can always lower the basket manually by pumping it down. It has never happened to me, though", Söderlund says.